It's rare to find a band whose internet presence seems to extend to two YouTube videos and a Soundcloud page. Seeing as that Soundcloud page reveals that London's Matthew Proctor is involved with Heavy Heart, I presume he/they are just being lazy rather than deliberately obtuse and mysterious like many acts these days. Beautifully crafted electronica awaits below. 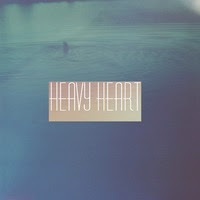 I'm not sure how long the Heavy Heart moniker will survive - there are literally dozens of bands across the world with the same name - but the songs are set to grow a life of their own. Taking on Purity Ring's baton of compelling electro-pop and Gold Panda's hypnotic sample splicing, the first signs are very promising. 'Around Us' particularly sparkles while the other track available, 'Everything You Do', is more of a sip-your-mojito chillwave number - a different but equally engrossing vibe. Download the tracks for free below. Head nod to Richard at Some Of It Was True!. Follow Heavy Heart at Soundcloud.com/heavy-heart-music.